If you are considering buying an rv cover and you are confused about what is out there, you owe it to yourself to read through this. Whether you buy from us or not, this will give you a good understanding of what is out there. Reading this could very well save you many many hours of researching, thinking and sorting information about RV covers. It also may save you many many dollars. Reading this will help you make an educated decision concerning what rv you want. Again, whether you buy from us or not, if you are pontentially in the market for an rv cover, you owe it to yourself to read this. It will only take a few minutes. We appreciate you taking the time to look. First of all, there are hundreds or maybe thousands of brands and types of RV covers out there. We have studied these extensively, and they can be grouped into 3 general categories of covers. 1. TARPS...You will see some rvs covered with tarps. Tarps are commercially available and inexpensive, but they generally do not look good and do not last long. The are also somewhat difficult to deal with since they are big and flat and are not made in any way specifically to cover an RV. They also are just a moisture barrier, so they keep water out, but also keep water in, which can cause serious damage in terms of rot, mold, mildew, etc. We would highly recommend avoiding tarps as rv covers. 2. CUSTOM COVERS...You will see some very expensive covers ($1000-$2000+ range) These are custom made for a given RV and an upholstry shop has to make them, or you would have to normally buy one from the company that made your RV. They are a very good fit, but are very expensive. The quality is good, but is not better than what we sell. They probably will fit better, as it is a 'custom' cover but there is a hefty price to pay. Also, they are generally awkward, heavy, and difficult to install. A RV dealer recently told me that it takes 4 people to install his customer cover. 3. SEMI-CUSTOM COVERS... What we sell is right in between these 2 referenced previously. We call ours semi-custom covers. They provide a custom fit most of the time for most RVs. Our covers always always cover the entire top and the entire sides. Please see our pictures. There are tremendous economies to be found by investing in one of our covers. 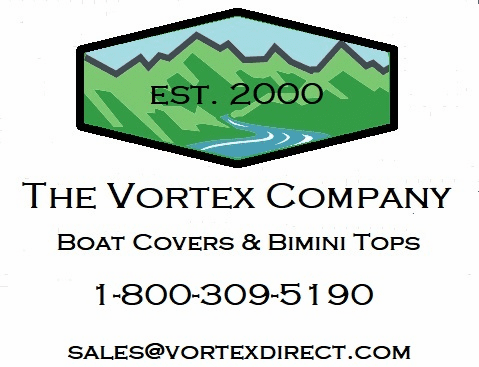 Our Deluxe Pop Up Camper covers come with the same reliability and level of performance that you all have come to expect from Vortex. This is they type cover you want, almost always. They are made of a 3 layer non woven material...excellent for camper covers...This combines the ideal economy with the ideal performance. Call us with any questions. We will be glad to help you. 1. Fully polypropylene fabric repels rain and vents inside vapor out. 2. Designed to protect your investment from Harsh UV ray and keep interior cool. 3. Superior water resistant yet breathable to help prevent mildew inside of the fabric. 5. Excellent for temporary use! 6. Elastic in bottom corners to fit like a fitted sheet! The length of pop up camper that this cover fits is listed above, in the title. 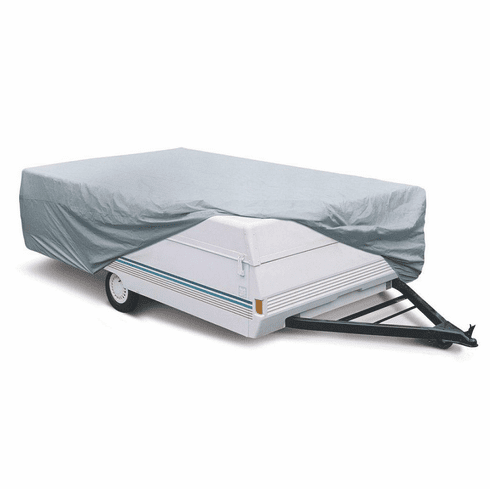 Our pop up camper covers are 87" wide across the top, and come down about 42" on this sides. This is ever so slightly oversized, and allows it to fit over a roof top a/c unit very well. Please call us with any questions at 1-800-309-5190. This is not a disposable type cover. It is made for years and years of use. It has a 3 year warranty.